House hunting is exciting, exhausting and stressful… and that’s only for the adults. Throw in a few small children and it can be almost too much. 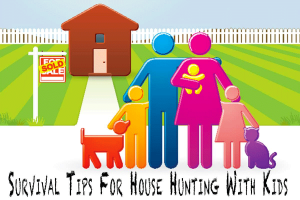 So how do you manage to hunt for your next home with the kids? Here are some survival tips for all the parents out there. First, if you can leave the kids at home with a sitter or drop them at grandma’s house, do it. Think about it, your six year old heads in one direction, the four year old in the other, all while the two year old goes directly for the most dangerous thing in each room. And you’re going to be able to concentrate on the home you are touring? Hardly! So if you can, leave them home. If you want them to see where they might be living, then do a second look through of your narrowed down choices. If you have to bring the kids, be prepared! Pack snacks, drinks and their favorite toy. If you have an iPad or tablet with some games, bring that. Then keep the house hunting moving. If you walk into a home that just doesn’t appeal to you from the git-go, tell the Realtor immediately so you can move on. The other consideration is safety. You never know what may be behind a door, handrail-less stairs or sunken tubs or rooms that kids could hurt themselves with or in. Set basic rules with the kids that they keep their hands to themselves, don’t open doors, hold parental hands and that misbehavior will NOT be tolerated should be reviewed before each house showing. Also, follow in your own car so you don’t have to move car seats or worry about kids spilling the aforesaid drinks or snacks in the Realtor’s vehicle. The upside? You can discuss the properties without the listening ear of the Realtor! Have them do some of the footwork about the area on the internet, and when at homes have them take pictures or keep a checklist. Younger kids can feel included if you let them have input about what they want in their new house. Their own bedroom? A playroom? Big backyard? BUT, don’t let them think they have the last word. As parents and the people paying for the home, you are in charge. They may want that huge house you saw with the inground pool, but you know it’s out of your budget. Be the parent!